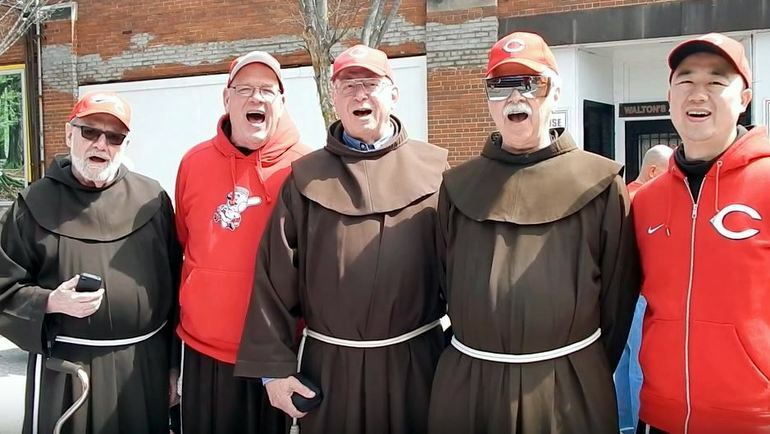 Friars Tom Speier, Tim Sucher, Carl Langenderfer, Pat McCloskey, and Stephen Cho sing, “Take me out to the ball game,” at the Reds Opening Day parade. My love affair with baseball and especially the Cincinnati Reds began around 1939 with Ernie “Schnozz” Lombardi’s “Swoon” during the World Series that year. He was my Mom’s favorite Reds player. She kept defending him when he was blamed for allowing the winning runs to cross the plate in the 10th inning of that World Series after a collision at the plate that flattened him and allowed Joe DiMaggio to score all the way from first base. I was 7 years old at the time, but her love for Lombardi set me on a course of loving the Reds and wanting to be a catcher in baseball. Mom was afflicted with a severe case of rheumatoid arthritis that made any travel difficult, so her enjoyment was listening to the Reds’ games on radio every day and rooting for Lombardi, the Reds catcher and a great hitter. I quickly got baseball fever. Besides Lombardi, there were two Reds’ pitchers who were my favorites – Bucky Walters and Paul Derringer. True, they were great pitchers but they were also my “Lucky Twirlers”. Twirlers were what we now call baseball cards with pictures of the players on one side that came with bubble gum. Even in those days we collected them. One way to collect them was to compete with another kid to “twirl” or flip your card against his. If mine came picture-side up and his didn’t, I got to keep his card. For some reason, my Bucky Walters card invariably came up “heads” (legally, mind you). 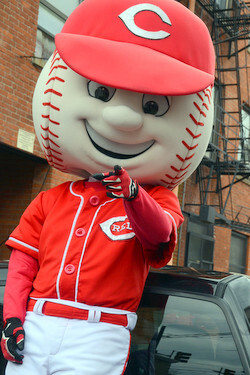 This only increased my following of the Cincinnati Reds. Cincinnati had a great thing for kids with their “Knothole Leagues”, which are still going to this day. 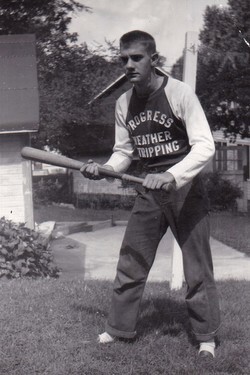 Baseball teams were geared to age levels. I soon saw myself as a “Manager” and put together a neighborhood team (Fr. Bruce Hausfeld was my right-fielder!) for the youngest level. I still remember riding my bicycle out to Elmwood from St. Bernard to register “MY” team with Supervisor Hoyt and get our schedule for the summer. I must have been all of 11 or 12 at the time! One of the advantages of the Knothole Leagues were the FREE Reds games offered several times during the year. Admission was gained by showing your “Knothole Card.” Can you imagine the thrill of taking the streetcar down to Crosley Field to watch my idols play a Major League game? 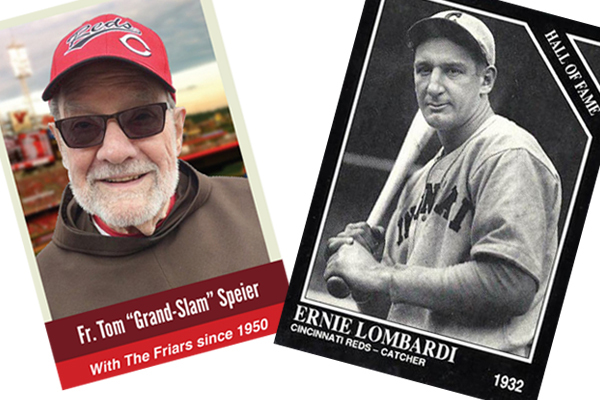 My other thrill at St. Francis Seminary was catching the biggest game of the year – the Picnic Day game when we played the OLD guys, the Franciscan priests from the Cincinnati area. I was catching James Beiersdorfer (later Fr. Emery), and Fr. Conan Taylor tried to steal home but I blocked the plate and tagged him out (and got spiked). Conan always “played for blood’ and complained loudly that Beiersdorfer “broke his wind-up” when he saw Conan trying to steal home. I had no idea what Conan was talking about but Beiersdorfer later privately admitted to me that he was guilty. Later in the game I hit a GRAND SLAM home run off of Fr. Gerald Held and was mobbed at home plate by my fellow students. Oh, yes – we also won the game. We managed one way or another to keep up with the Reds all through those seminary years even though we never got to see a Sports section of the newspaper. One way during our theology years at Oldenburg was to go down in the basement below the “Old Friars” recreation room where we could hear the Reds games from their radio through the floor. 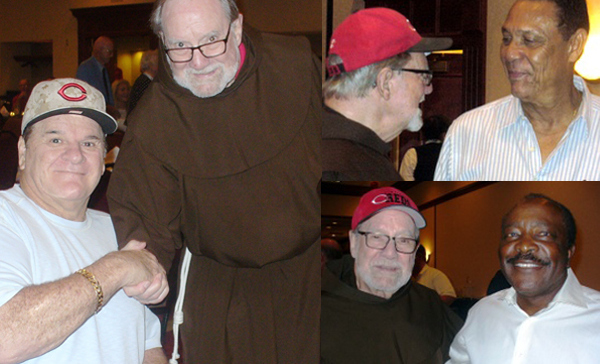 Since Hilarion Kistner, Paul Desch and Paul Brockman (all older) were hunched over listening in the dark, I figured it must be OK.
Now that the Cincinnati Reds (courtesy of Mr. Castellini) provide one FREE pass for almost all games to our parishes (catchers have first dibs), my biggest thrill is representing the Franciscan Friars in the Findlay Market Opening Day Parade.